As of this month, I’ve merged my independent consulting practice into 151 Advisors, a global strategic consulting firm for mobile and Cloud-based technology companies. I’m building a strategic consulting practice within 151 Advisors focused on helping companies in the Internet of Things, M2M, location-services and telematics — and the services they enable — launch new products, break into new markets, acquire strategic partners and channels, and organize for success. My partners at 151 Advisors and I leverage two decades of hands-on experience in the sector, and are skilled at building targeted, multidisciplinary programs that achieve extraordinary results through coordinated marketing, business development, product development, and channel activities. We see the opportunity to provide quality professional services to an underserved and rapidly growing market: while there are many growing companies in the Internet of Things/M2M/LBS/Telematics sector, there are few, if any, business focused consulting firms with deep roots in the space. 151 Advisors (www.151advisors.com) is a strategic consulting firm that helps technology companies solve critical business challenges, seize new market opportunities and achieve real results. 151 Advisors works with companies of all sizes – from growth-stage startups to large global corporations – and has more than 100 years of combined experience building profitable technology companies. In addition to developing and executing growth strategies for companies in the U.S. and Canada, 151 Advisors partners with economic development organizations such as Enterprise Lithuania and IE Singapore to help OUS tech companies enter the North American market. Thanks, all of you, for your continued support, friendship and/or business. I’ll be continuing my column “Unplugged” in Connected World Magazine, in addition to building my new practice. 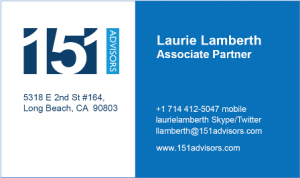 I look forward to continuing to serve clients and the mobile industry through my partnership with 151 Advisors. I encourage you to give us a look –we may be able to help your company grow sustainable new revenue streams.